This week (or perhaps eleven days hence as with President George Washington) marks the three hundredth anniversary of the birth of Philip Ludwell III of Virginia, the first known American convert to Orthodox Christianity. It stands to be remembered as an important date in the history of the Orthodox Christian Church both in America and Europe. It is also not without relevance to a broader understanding of how the United States came into being. January 2016 celebration of 299th anniversary of Philip Ludwell’s birth. The wine label features Ludwell’s Green Spring mansion. Last year a group of us met to enjoy a hearty colonial Virginia-themed meal interspersed with songs and readings to celebrate the 299th anniversary. At the beginning of our evening a piece was read that I had written for the occasion. I share it here in an updated form as an ode to the life and achievements of an important early American who found in the Faith of the “Greek Church” an ancient path that allowed him to unite the mind and the heart and avoid succumbing either to lifeless rationalism or individualistic emotionalism. It was at Green Spring in the night betwixt Friday the twenty-eighth and Saturday the twenty-ninth of December about twelve of the clock, in the year of Our Lord 1716, that Philip Ludwell III was born. Nothing is known of his childhood save that when barely eleven years old he suffered the loss of his father Philip and in his fifteenth year that of his mother Hannah. The young Philip’s later life would follow her example whose epithet records as living a most exemplary Life spent in Cheerful innocence and the Constant Exercise of Piety, Charity and Hospitality. After completing his education at the College of William and Mary the twenty-year-old Philip was married to Frances Grymes at her family’s home of Morattico on the Northern Neck of Tidewater Virginia. The announcement of Philip Ludwell’s wedding in the Virginia Gazette, July 1737. By then he was already one of the largest landowners in British Virginia and would become one of the most avid horticulturists of early America. But he was also concerned with cultivating the garden of his own soul. So in the summer of 1738 he traveled to London, England, where a tiny community of Orthodox Christians had begun to worship twenty-two years earlier at the time of his birth. A priest of that church would later recount that he came to London seeking the True Faith, which he, with God’s help, has swiftly found in the Holy Graeco-Russian Church. And so on the 31st of December of the same year  he was confirmed in the same with the holy Chrism. Returning to his native Virginia in 1740 he was mindful of his family’s motto pensieri stretti edil viso sciolto [The thoughts secret and the face open] and so practiced the prayers of his newfound Faith privately whilst growing in public prominence in the colony. He served as a member of the House of Burgesses (the first popularly elected legislature in the New World) in the 1740s and from 1752 as part of the Royal Governor’s Council. In these capacities he lived out his beliefs by advocating against the importation of African slaves, heading a committee to seek a cure for cancer, organizing the resettlement of French speaking refugees from Nova Scotia, and working to strengthen the defense of the frontier from French and Indian raids. 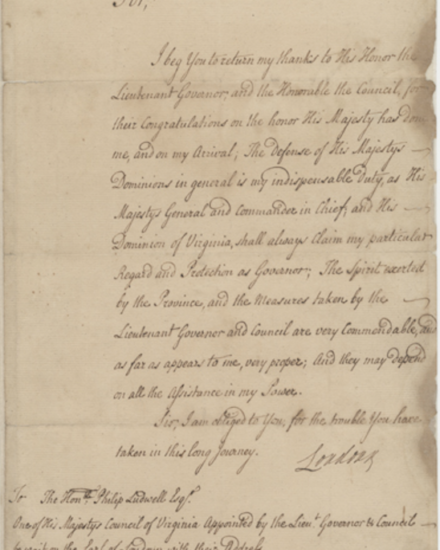 Ludwell’s address welcoming Lord Loudon as the new commander of British forces in America in 1756 during the French and Indian War. 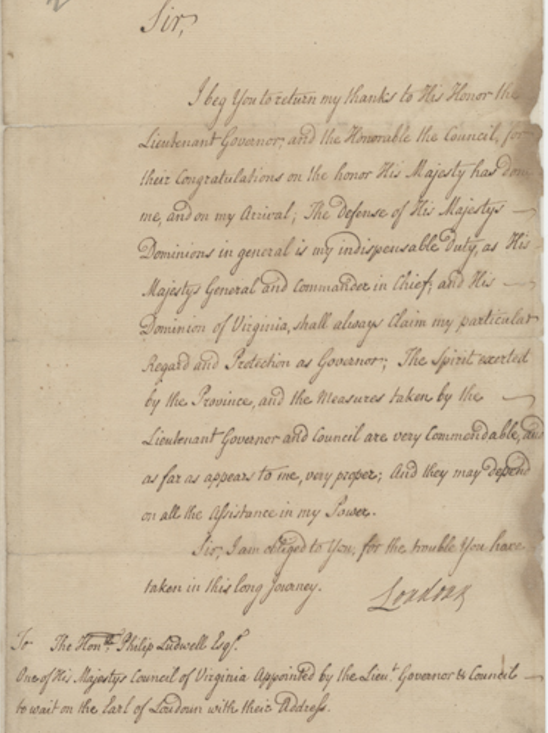 In this latter work he advocated for the appointment of a young George Washington as Colonel (commander) of the Virginia Regiment, the first all-colonial professional military force. Beyond Virginia he supported the work of Benjamin Franklin through founding donations to the Pennsylvania Hospital and the Philadelphia Academy. Later he would help to fund the efforts of Franklin and others in establishing the first school for African American children in Williamsburg. Three daughters: Hannah, Frances, and Lucy, were the fruit of the marriage of Philip Ludwell and Frances Grymes. 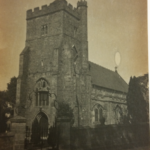 Their mother died in 1753 and so in 1760 Ludwell brought his three daughters to London minding to have them united with the Holy Eastern Church there, gaining through this union the one Mother for them and himself. In 1762 they followed their father’s example by being received into the Church. At this time Ludwell hoped to return to his native Virginia with his daughters and the Holy Synod of the Orthodox Church of Russia, recognizing his perfect will to hold fast, now and henceforth, to our Orthodox faith, blessed that he should be given the Holy Gifts to take with him to America. By this time he had also embarked on the translation into English of the three most commonly used Orthodox liturgies together with other services as an order of prayer to follow in his native land. The Holy Synod also very swiftly blessed the printing and distribution of Ludwell’s English translation of an Orthodox catechism and for him to dispense it freely to those who would like to own it for their benefit. 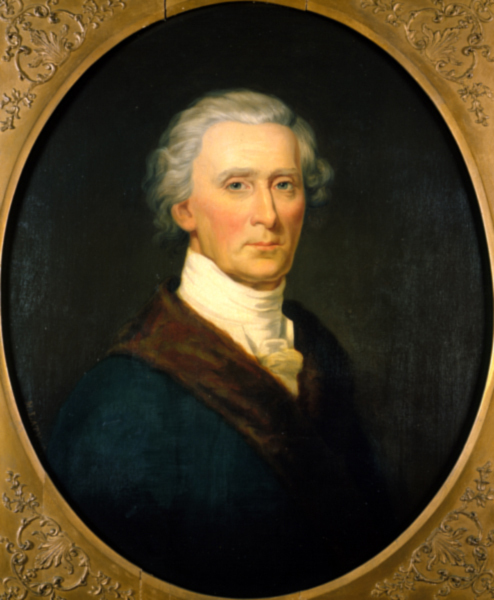 Charles Carroll, friend of Philip Ludwell and signer of Declaration of Independence. Throughout the 1760s his health was declining and so he remained in London where he was able to receive Holy Communion several times each year. Despite his infirmity his home near the Strand was always a hospitable place. A frequent visitor was the young Charles Carroll of Carrollton who would later become the only Roman Catholic signer of the Declaration of Independence. Carroll wrote of Ludwell that his company & friendship is desirable; his esteem wou’d rebound to my praise; tis glorious to be esteemed by men of worth: among these Mr Ludwell ought to be ranked if true politeness, solid sense, a virtuous mind & a good heart deserve this appellation. On February 22, 1767, the ailing Philip Ludwell confessed and received communion and holy unction in his London home. Three weeks later, on Wednesday, March 14, he died there at five o’clock in the afternoon. The following day the Canon after departure of the soul from the body was read and the next Monday at the beginning of the fifth week of Great Lent his funeral service was chanted at the Orthodox church in London. 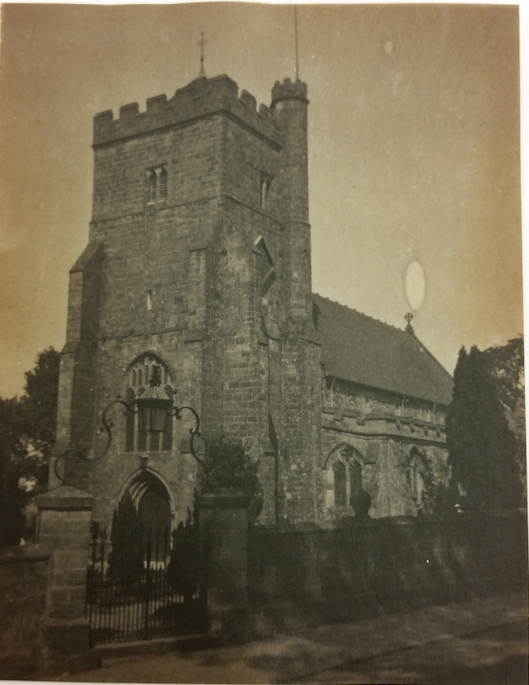 The burial place of Philip Ludwell III from a 1943 postcard. The Eucharistical Prayer for the Steadfastness in the Faith. Everyday will I give thanks unto thee & praise thy Name. O Let me have understanding in the way of Godliness. For thereby is thy Servant taught & in keeping of thee there is great Reward. 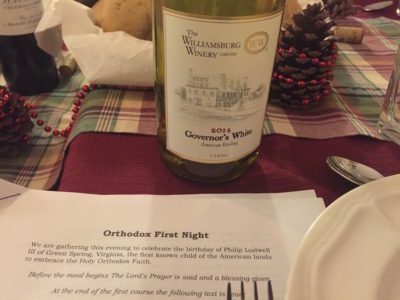 Perhaps on the evening of December 28/January 8 you will consider joining Philip Ludwell III in this prayer and propose a toast to this ever memorable forerunner of Orthodoxy in America and the West. Happy Feast Day of the forerunner of the faith in America, the covert soldier for Christ, Philip. Happy Feast Day! Interesting material here,in Orthodox Life, and above re: Old Style Christmas!